This year marks the ArtWalk’s 42nd Anniversary Season. 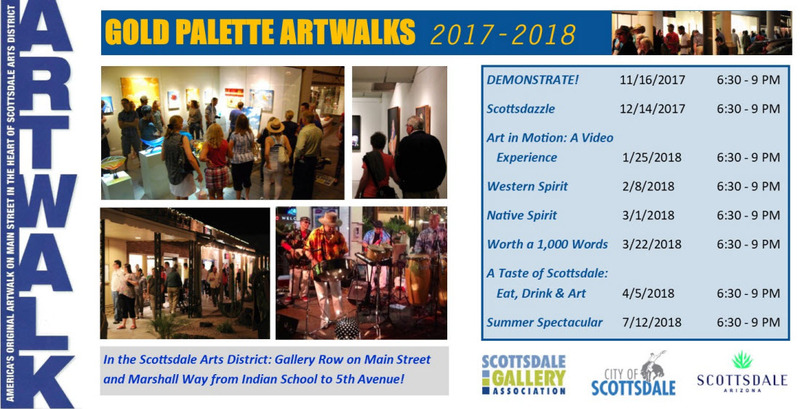 “America’s Original ArtWalk” is much like a large, easy-going open house for the Scottsdale Arts District. ArtWalks are free to the public every Thursday evening from 6:30 – 9:30 p.m. along Main Street from Scottsdale Rd. west to Goldwater Blvd., and on Marshall Way north of Indian School Rd. to Fifth Ave. It is a time when all Scottsdale Gallery Association galleries open their doors to the public and show off the work of some of the Southwest’s most outstanding artists. Proceed at your own pace, wander into galleries that capture your fancy, stroll around a delightful area punctuated by dramatic statues, bubbling fountains, tree-covered courtyards, famed restaurants, live music, food trucks and more. Horse-drawn carriage rides during cooler months, and trolley rides are often available from plentiful free parking areas nearby.